A material designed originally to help rockets blast into space is now helping scientists in America to grow stem cells in large numbers outside the body, potentially ushering in a new field of medicine where doctors prescribe cells rather than drugs. Figure 1: To the naked eye, the Cytomatrix looks like sponge. Known as the Cytomatrix, the material is made by coating a carbon skeleton with metals at very high temperatures. 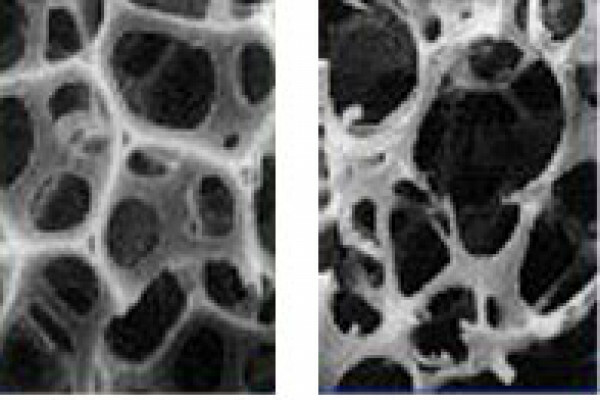 With the naked eye it resembles a hard piece of sponge (figure 1, right), but under a microscope it is almost indistinguishable from bone marrow (see figures 2 and 4 below). "When you take stem cells out of the body and add them to our matrix," says Michael Rosenzweig, chief scientific officer at Cytomatrix, "they can grow in three-dimensions, the way they normally do in the body". Because it so closely mimics the natural environment of the body, stem cells grown on the Cytomatrix secrete their own growth factors which means they can multiply, producing 4 to 6 times as many cells, whilst retaining their full stem cell characteristics. Until now, when scientists tried to grow stem cells outside the body, powerful growth factors were needed to make the cells divide. Whilst this produced a large increase in the number of cells, it had the unfortunate consequence of also causing the stem cells to lose valuable characteristics such as the potential to turn into any cell type in the body, and the ability to repair damaged or diseased tissues. The remarkable potential of the Cytomatrix to overcome this problem was first noticed after it was tested as a bone implant for use in joint replacements. Researchers were surprised to see not only the hard outer part of the bone growing into the porous surface of the matrix, but also bone marrow cells thriving on it too. Subsequent tests showed that the matrix could safely be implanted into the bone marrow cavity where it could support the growth of the full range of bone marrow and blood cells (figure 3). "This led us to suspect that it might be able to provide a surrogate bone marrow for the expansion of stem cells outside the body," explains Mark Pykett, one of the scientists working on the Cytomatrix. One source of stem cells that scientists and doctors are particularly excited about is umbilical cord blood which can be harvested from the discarded placenta and cord of a newborn baby. Cord blood stem cells are viewed as extremely promising candidates for stem cell therapy because collection is simple and risk free, and there are fewer complications, such as graft versus host disease, when umbilical cord blood stem cells are donated to unrelated patients, possibly because these cells are more 'tolerant' than stem cells obtained from other tissues. Owing to their therapeutic potential, there are now a number of companies around who, for a small fee, will store your umbilical cord blood stem cells until you need them. Indeed, last year about 10% of American newborns 'banked' their cord blood stem cells in this way. But, like most stem cells, cord blood stem cells are only present in limited numbers and it is often difficult to obtain them in sufficient amounts to successfully to treat a patient. At the same time, the number of conditions that can be tackled using stem cells is rising exponentially; there are now over 70 different diseases that can be treated this way, meaning that, for most people, a single cord blood collection will probably not be sufficient for a lifetime's needs. It was with this problem in mind that Cordlife, Singapore's first umbilical cord blood stem cell bank, recently announced an US$11 million deal to acquire Cytomatrix, with the aim of using this technology to grow umbilical cord blood stem cells. This approach has been successfully tested in animals, and Cordlife are now about to begin clinical trials in human patients. Crucially, the ability to expand the number of available stem cells makes it possible to treat multiple diseases and, potentially, multiple patients. "If we can grow the stem cells," explains Soren Müller Bested, Cordlife's chief technology officer, "then it may also be possible to use some of the extra cells generated to treat other people who also need a stem cell transplant but have no available stem cells of their own". The other major benefit of establishing a pool of your own cells is that, rather than using stem cells only as a last resort, doctors can begin to prescribe prophylactically, to help offset some of the effects of ageing. But for those craving immortality, be warned, "we're not talking about eternal life, just allowing people to stay healthier when they get older," says Müller Bested. Acknowledgements I am indebted to Soren Müller Bested, Sher Min Gaspar, Ronald Hee, Ian Brown and Steven Fang , from Cordlife, Singapore, and Mark Pykett and Michael Rosenzweig from Cytomatrix, Boston, US, for their help in putting together this article and the accompanying radio interview.